Leeds 602 is seen in service near to the depot at the 2003 Crich Tramway Village Tramathon on 8 June. Possibly one of the least used trams in its service life 602 was built new by bus manufacturers Charles H Roe and entered service in June 1953 operating until withdrawal in 1957. The design of the tram owes a lot to Glasgow as the General Manager of Leeds at the time was A.B.Findlay who had prepared drawings for a single deck version of the Cundarder. When at Leeds Findlay used these ideas for two prototype single deckers (601 and 602). 602 was equipped with VAMBAC equipment located below the bow collector when new and all equipment on the tram was electric making it a very complicated tram. 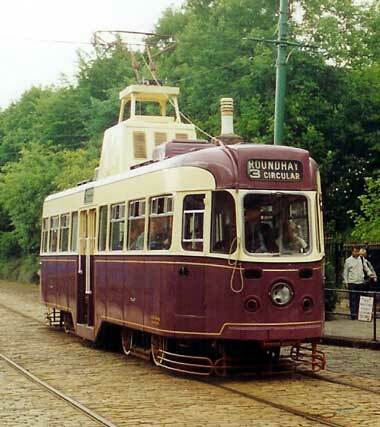 602 was mainly used on the Hunslet route before its withdrawal and as it was the final development of the traditional British tram it was secured for the National Tramway Museum arriving at Crich in 1960. Once at Crich it was used briefly in 1967 and 1972 before its first workshop attention during 1973 with further stints in service between 1975-6. More workshop time was seen in 1977 with service seen in 1979-80 and then a third workshop visit in 1986 with a longer use in service following this from 1987 to 1995. After this the tram was withdrawn from service after a leak was discovered in the roof but the tram was resurrected on a limited use basis in time for the special events of June 2003 and the tram proved to be one of the stars of the 2003 Tramathon. It has since, again, been withdrawn from service.